Here are a couple images of egg laying this past spring. Eastern Painted Turtle at Bassett Pond inside Quabbin’s Gate 33. Common Snapping Turtle inside Gate 35 under the power lines. Although I look close to them, both were made with telephotos. While it isn’t nice to get too close as they may abort their laying, snappers are called that for a reason. But mainly I keep my distance out of respect for motherhood. This entry was posted in Animal Behavior, Nature Photography and tagged Chelydra serpentina, Chrysemys picta, Common Snapping Turtle, eastern painted turtle, egg laying, Painted Turtle, Quabbin, retiles, Snapping Turtle. Bookmark the permalink. I’m impressed. I thought these animals would have been lots more skittish. We’ve got Painteds in our pond and I can’t imagine they would allow us to get so close. Perhaps you are a Turtle Whisperer? Also, you were lucky to be able to witness egg laying – I can’t imagine that many people can make that claim! I can’t say one way or another as far as other people, but I have photographed snappers several times. This was my first for a painted. I visited a laying site here in Amherst for box turtles but, sadly, all the nests I saw were scavenged. I haven’t seen a box in decades, literally. They are skittish but a long lens helps with that. Painted especially are. Most times when I come across one sitting on a log it drops almost as soon as it becomes aware of my presence, even at a distance. They are a little slower to leave while laying eggs unless you get too close, at least in my experience. For the first shot, there were actually two others there as well who left as soon as they saw me. I didn’t approach any closer so the third just kept on keepin’ on. Future Turtles of America sounds like a high school club. Cynical me had the thought that some turtles know more than some high school “graduates” these days. Well, it’s been proven that some adults are not smarter than a 5th grader. 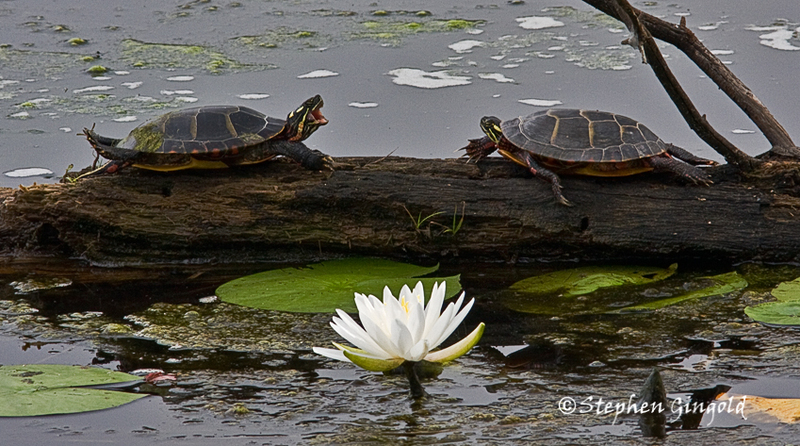 It was the standoff stance of the two turtles that made your photo special. One appears to be dominant…at least in this encounter. What a great set of experiences. I’ve never been in the right place at the right time to witness this. I’m glad you were there to capture it, and with the animals best interests in mind. Thanks for sharing. Thanks, Todd. Just luck as in both cases I wasn’t even thinking of seeing them. As a side note I have a small collection of turtle figurines, I think about 14 of them maybe, They are displayed in a lighted cabinet on a shelf with figurines of birds and African animals. I have no idea whether the nests were successful or not, but hope they were, of course. Nature has no sentiment in these cases but I guess predation keeps the populations at a good ecological level. Motherhood and finger-safety. All good. To my knowledge we don’t have these here, but we do have terrapins and they go from ‘I’ll have a little nibble of this worm, oh, did you say it’s your finger?’ babies, to horrible things that menace people. I’ve not lost a finger to a snapper, but getting in range of their jaws is to be avoided. I’ve never known a turtle to threaten anyone unless in defense and most will just withdraw into their shells. Snappers are the only ones that I am aware of as getting aggressive if threatened. Every spring, the Turtle Patrol is a big deal here. Texas Parks & Wildlife, Texas A&M University in Galveston, Master Naturalists, NOAA, and just plain folks band together to monitor the Kemp’s Ridley’s nests. Turtles are so interesting, and these photos are great. The eastern painted turtle’s especially attractive. I usually only see red-eared sliders, and they’re almost always in the water. I know we have snapping turtles around, but I don’t think I’ve ever seen one. Looking at yours, I’m pretty sure I’d remember it if I had. Such a fierce face! That snapper “look” is another reason to keep one’s distance. Neither of my turtles are nearly as threatened as the Kemp’s Ridley which is a good thing. But as with many, their health is a good indicator of the health of the environment. I’ve yet to see a red-eared slider but I am not exactly in their habitat. I love painted turtles, and they always make me laugh, when they slide off a log, one by one, like a those old newsreels of Billy Rose’s Aquacade. When I was in high school, my sister & I visited an Audubon center at the Montezuma wetlands (between Syracuse and Rochester) and the guide picked up a snapper. When you see how far their neck can stretch, you’ve even more inclined to be wary! I’ve heard about their reach and would not pick one up if I could help it. I’ve heard various suggestions for moving them out of the road and not one was to pick it up by hand. I experienced one of those slides this morning but only with a solitary painted. Nice plop it made. I lived in Syracuse for a few years as a child in elementary school but the only exploring I did was in my immediate neighborhood between home and school. At just about the same exact moment, another blogger mentioned that she went to Syracuse in elem. school! BlueBrightly, also a nature photographer. Hah. That’s Lynn. I’ll mention that to her the next time one of us comments on the other’s post.